The 2nd Amendment T-Shirt is a two sided print in black. 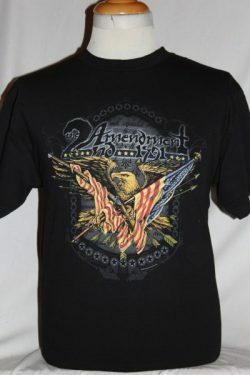 Front Design Only: Flag pole and musket crossed with draped American flag on both. 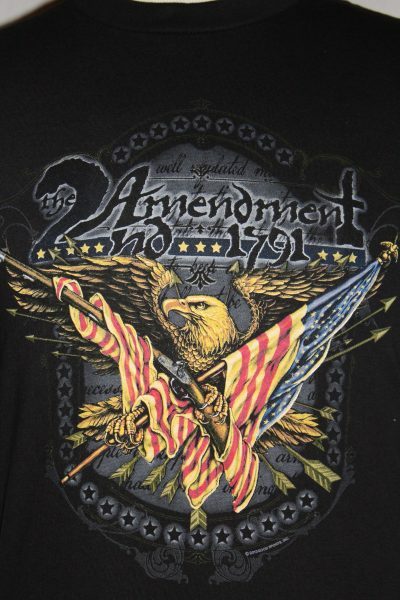 Eagle and arrows superimposed over 2nd Amendment text. Alstyle 100% heavyweight cotton, 6.1 oz., preshrunk t-shirt. This shirt has double-needle stitching throughout; seamless rib at neck; shoulder-to-shoulder tape. This shirt will wear well and retain its original color and decoration after multiple washings. Note, we use the best quality preshrunk shirts available!